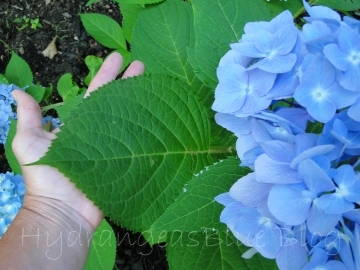 The macrophylla hydrangea variety is also known as “big leaf” and I’m adding a photo here of my Endless Summer to show you the size of the leaves. This blue flowering plant is doing quite well. The other macrophylla I have is Blushing Bride and it’s also blooming, but in white. It is also full of big, green leaves like this one. I’m hoping that as the plants mature, the flowers will show up better in stead of being hidden among the greenery. The blue one has one big bloom on top which is slowing fading to lavender. And it has a small flower on the side which began as light lavender and is now changing to pink. Go here to read more posts about the macrophylla hydrangea.